Taylor’s Baby guitar line was designed to meet the needs of those guitarists who (a.) wanted a smaller sized guitar for travel, (b.) had hands too small for a full sized acoustic guitar, or (c.) wanted to start their children off playing guitar. And like all Taylor has done in the last 10 years, the Baby Taylor line is high quality, and high-demand, and the Taylor BT2 is one of the most popular models to date. Smaller guitars are always harder to manufacture properly, as the smaller size, though in some cases only slightly different than a full sized guitar, makes the overall guitar more fragile. 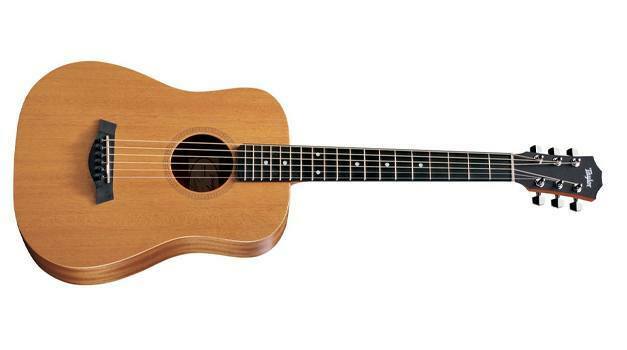 Taylor’s Baby line circumvents that problem easily; the laminate sides and back, while not the best tonally, make the instrument much more solid at its smaller size, providing extra durability. Out of the box, the guitar is beautiful–the fret ends are even, none of the frets overly shaved or nicked, and the hardware is well suited to the guitar’s shape and size. Laminate is usually a bit of a troubled area–most guitarists avoid it like the plague–but in this case, the laminate works because it offers more durability to the instrument. It does feel a bit artificial, as all laminates do, but much less so than laminates used by cheaper instrument manufacturers. The varnish on the neck and top are smooth and soft, lending the wood a nice feel that is pleasant beneath the fingers, and allows for the most movement freedom possible. Judging a guitar by its features is easy; judging a guitar by its size is a bit more difficult. The smaller size of this guitar does make a massive difference, especially if you are used to playing full sized acoustic guitars. It feels like a part of the instrument is missing, and it seems to have less substance. But because the Taylor BT2 is meant to be used as either a travel guitar or a kid’s guitar, the size makes perfect sense. The action out of the box is optimal for guitarists of all experience levels–not too high, not too low, just a nice middle ground that makes for easy playing. For a little guitar, the Taylor BT2 Mahogany sounds big. The tropical mahogany top has a bold tone, projecting hugely every single note, chord and arpeggio. The laminate works surprisingly well, supplementing the darkness of the mahogany nicely and giving it a bit more bass and evened-out mid, resulting in notes that resonate longer and chords that feel and sound richer and more powerful.